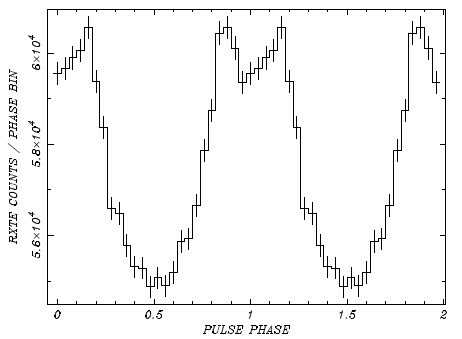 Folded light curve of the pulsar discovered in HESS J1837-069, PSR J1838−0655, obtained with RXTE in the 2−20 keV band by Gotthelf and Halpern (2008). The pulsar has a period of 70 ms, an energy output of 5.5 x 1036 ergs/s, and an estimated age of 23000 years. In the H.E.S.S. survey of the Galactic plane (Aharonian et al. 2005, 2006, SOM 12/07 ), a significant number of new gamma-ray sources was unveiled, some of which could not be associated with known objects. Follow-up observations with other instruments, in particular with space-based X-ray imagers such as Chandra or XMM-Newton, have since revealed X-ray counterparts of H.E.S.S. sources - in some cases extended nebulae, presumably generated by electrons accelerated in the fields of yet undetected pulsars, forming a pulsar wind nebula. A particularly spectacular discovery was reported recently by Gotthelf and Halpern (2008), based on Chandra data taken in 2006 and on RXTE data taken in 2008 in the field of the source HESS J1837-069. HESS J1837-069 was first reported by Aharonian et al. (2005); it is an extended source of about 14 by 6 arc minute size (Fig. 1 and Fig. 2), a gamma-ray flux of around 10% of the Crab Nebula, and a relatively hard gamma-ray spectrum. The source coincides with X-ray sources detected in the ASCA Galactic Plane Survey: AX J1838.0-0655, which was previously detected by a number of other instruments and which was also detected by INTEGRAL at higher X-ray energies, and AX J1837.3-0.652. The nature of the objects remained unclear. At the location of the ASCA source AX J1838.0-0655, Gotthelf and Halpern (2008) find in Chandra data a strong X-ray point source surrounded by an extended X-ray nebulae of about one arc minute size (Fig. 3); the source AX J1837.3-0.652 shows a similar X-ray nebula, but a much fainter point source at the center of the nebula. RXTE observations between Feb. 7, 2008 and Mar. 5, 2008 were then used to search for pulsed X-ray emission and resulted in the discovery of the 70 ms pulsar PSR J1838-0655 in AX J1838.0-0655, see top figure. From the measurement of spin-period and its change with time, a loss of pulsar rotational energy of 5.5 x 1036 ergs/s was derived. About 2% of the pulsar energy loss is required to power the gamma-ray source; similar efficiencies are observed for other pulsars. Beyond photons of the cosmic microwave background, the intense light from the star cluster RSGC1 may serve as a target contributing to enhanced gamma-ray production, The offset between pulsar position and centroid of the gamma-ray emission is a common, although not fully understood feature of pulsar wind nebulae (e.g. SOM 9/05). The difference in size between the X-ray and gamma-ray sources can be attributed to the shorter lifetime of the higher-energy, X-ray emitting electrons, as compared to the electron population responsible for the bulk of the gamma rays. Fig. 1: Gamma-ray map of a section of the Galactic Plane, including the source HESS J1837-069 at longitude ~25 degr. Fig. 2: Gamma-ray image of HESS J1837-069, in Ra-Dec coordinates. Green contours resp. circles illustrate the locations of the two X-ray sources, the blue circle is the star cluster RSGC1. Fig. 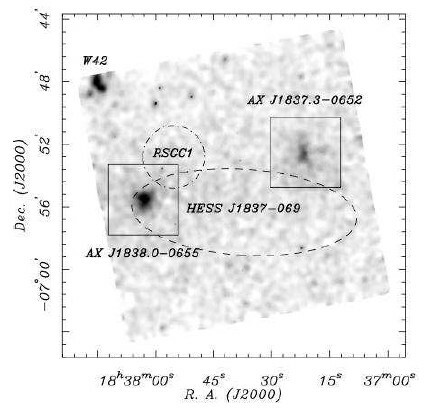 3: X-ray image of the region of HESS J1837-069, by Gotthelf and Halpern (2008), zoomed in compared to Fig. 2. The size of the very high energy gamma-ray source is illustrated by the dashed ellipse. 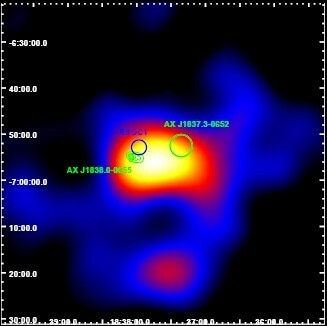 Two X-ray sources, AX J1838.0-0655 and AX J1837.3-0652 show extended X-ray nebula. Pulsed emission was detected from AX J1838.0-0655, identifying a 70 ms pulsar as the origin of the nebula.